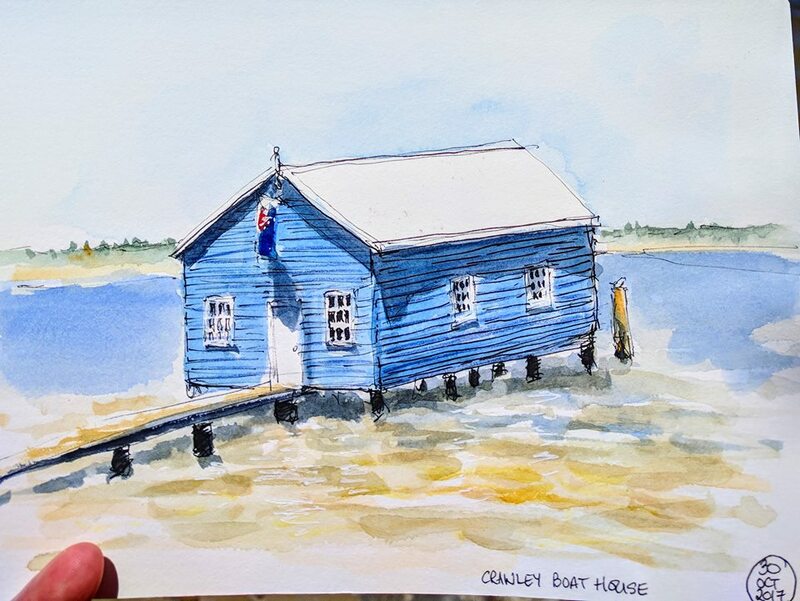 The iconic Crawley Edge Boatshed along Mounts Bay Road (just up from UWA) sketched about noon today. Constructed in the 1930’s I think this must be the most photographed building in Perth…There’s always a stream of people walking along the boardwalk to have their picture taken or to take a selfie, loads of wedding photos here on the weekends. But I don’t think that I’ve ever seen a boat inside the boathouse! Local artists gathered this afternoon in Perth’s Cultural Centre organised by the Black Swan Prize people and Leon Holmes. It was a casual plein-air competition with around 40 local artists painting for a couple of hours. Lovely to get out and paint again….I really enjoyed catching up with art friends and making new ones. 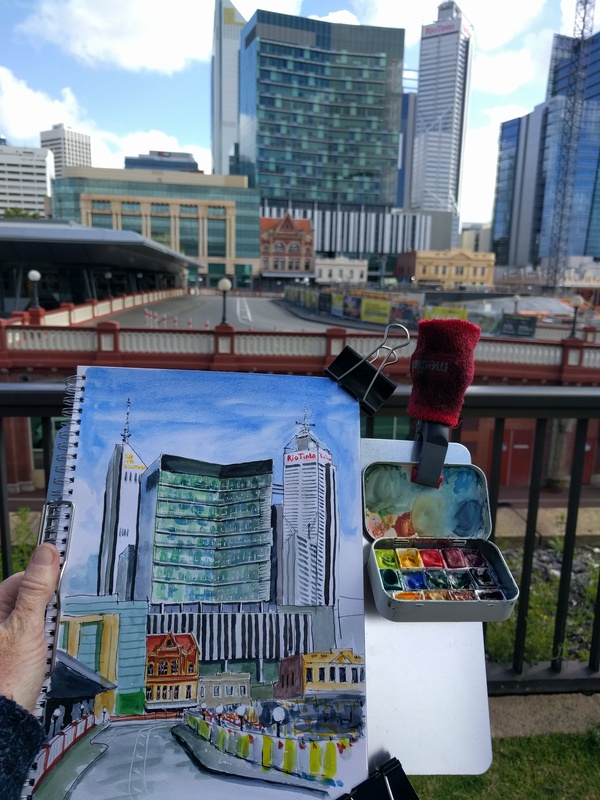 Above is my view of William Street (over the horse shoe bridge next to Perth train station) towards the city tower blocks. 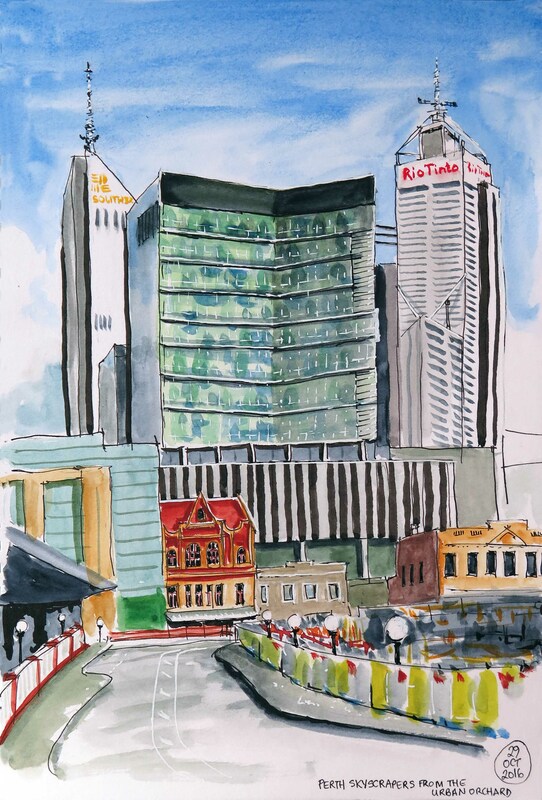 The redbrick building in the foreground is the State Heritage Office….an old building squeezed in between all the new angular office blocks. 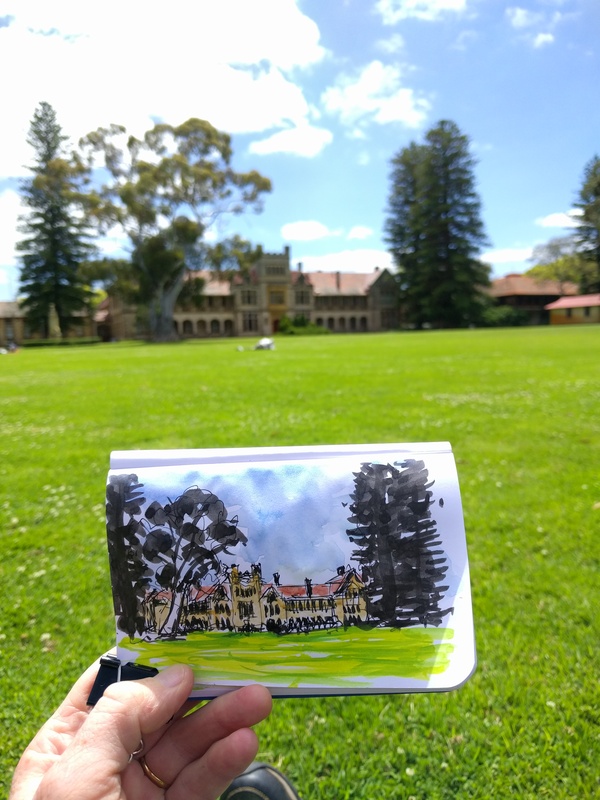 A quick, 10 minute sketch of the grand old Claremont College in Claremont, Perth….it was the only senior school teacher training college between 1902-1981. When it opened there were separate wings for male and female students with a matron who occupied a room positioned over the main entrance to the building – separating the two wings. It is currently owned by UWA. A 5 minute quickie sketch of a fellow painter in Kings Park yesterday. Lamy fountain pen black ink (water soluble) in Lamy Safari fountain pen, washed with clear water in Pentel waterbrush.